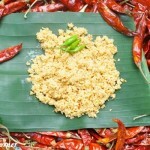 Though Sri Lankan Recipes are the most popular posts in Food Corner, I couldn’t share a Sri Lanka recipe for few weeks. 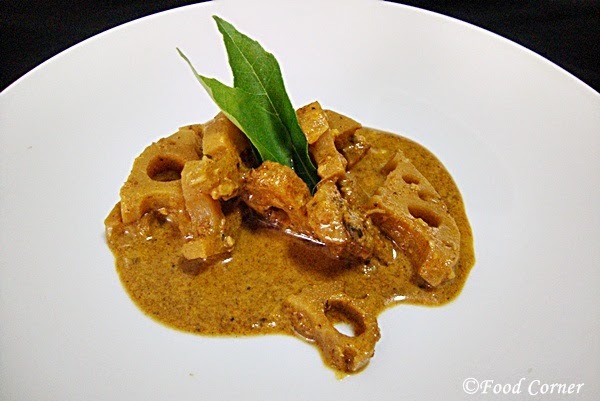 Finally, today I am with a Sri Lankan recipe on how to cook lotus roots. 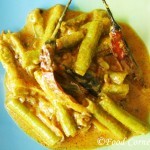 (Nelum ala).I’ve shared a lotus root curry recipe earlier, but today recipe is on how to cook it with toasted coconut. 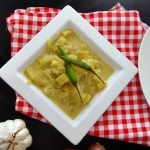 In Sri Lanka, we call recipes with toasted coconut as kalu pol recipes. 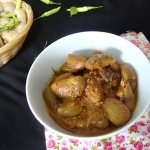 If you’ve checked, wattakka kalu pol maluwa is a popular recipe in Food Corner and of course it is a popular Sri Lankan dish at our home too. Recently, I tried lotus roots in the same recipe. 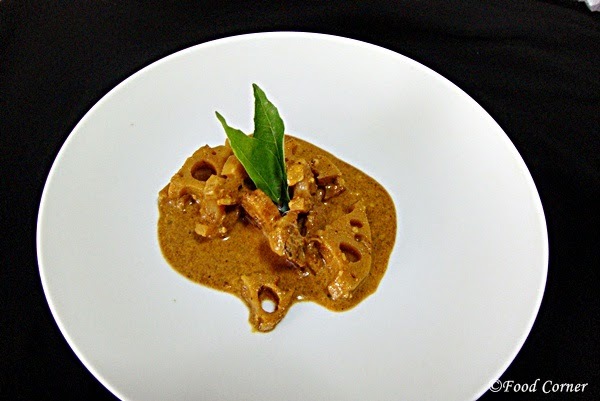 So, I name this as ‘Lotus roots kalu pol maluwa’ or ‘Nelum Ala Kalu pol maluwa’.Try this, it is sure be a hit of your home if others like lotus roots. Lotus roots are popular in Asian cuisine and there are different ways of cooking in different countries. 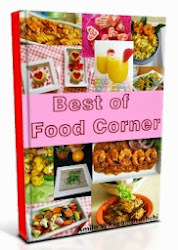 It is a popular root vegetable in many recipes including salads, soups and curries. If you are curious to know, I found that Lotus roots are with lot of healthy benefits. It Aids digestion, improves immune function and also an energy booster. Tips for buying Lotus Roots. Here are few things to check if you buy lotus roots. Look for firm ones. 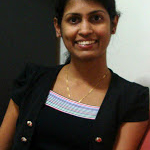 Ensure they are smooth and free from dark spots. If the lotus roots are with dark spots, check its channels. If the channels are also look dark or with black lining, it indicates that lotus roots are bit aged. Avoid those. Look for ones with no mud inside the channels. Since lotus roots grow in mud, there may have unwanted creatures inside the mud. Try to avoid ones with mud or be more careful when you clean them. 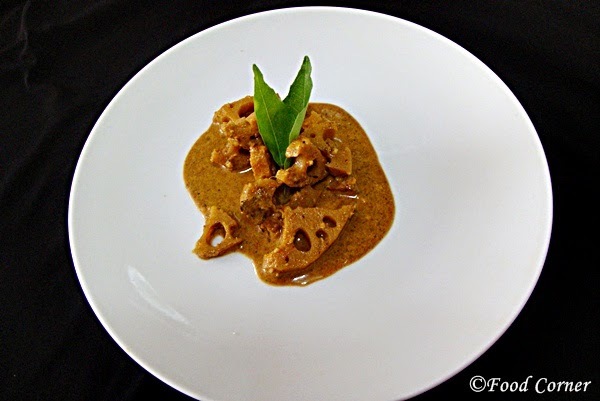 And here is my recipe for Nelum Ala Kalu Pol maluwa (Lotus root Curry Sri Lankan Recipe),try it next time when you find Lotus Roots. Before start cooking, we need to soak lotus root in water for about 30 minutes. Once soaked, it is easy to cook. Clean, remove the skin and wash lotus roots. Slice into pieces. In Sri Lanka, we find small lotus roots, so it is fine if you slice them into circles. But, here in Singapore, what we find is bigger in diameter. So, I cut them again into small bite size pieces. 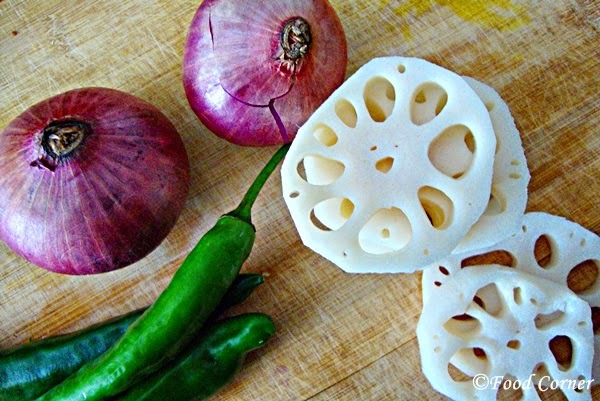 Keep sliced lotus root in a bowl of water to avoid any changes in colour. Meanwhile, dry roast all the spices. Keep aside. 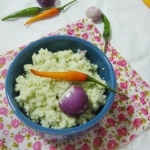 Also toast grated coconut together with raw rice until they are golden brown. In this step, be careful to prevent it from burning. Then grind coconut & rice into a thin paste. Keep aside. In a cooking pot,mix all roasted spices together with lotus roots. Add onion, garlic, curry leaf and rampa. Add some water or thin coconut milk . Cook until lotus roots are well cooked. Once it is cooked, add thick coconut milk & adjust salt. Stir well. Simmer in low flame for few minutes. Finally add grinded coconut & rice paste. Mix well. If the curry appears too thick, add little bit water & prepare the gravy in required thickness. Simmer for few seconds and remove from the fire. It is ready to serve with plain rice and other sides. 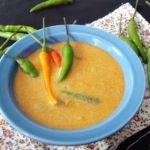 Enjoy this Sri Lankan recipe and also don’t forget to let me know if you tried this. Do you like Lotus Roots? If so, how do you cook?